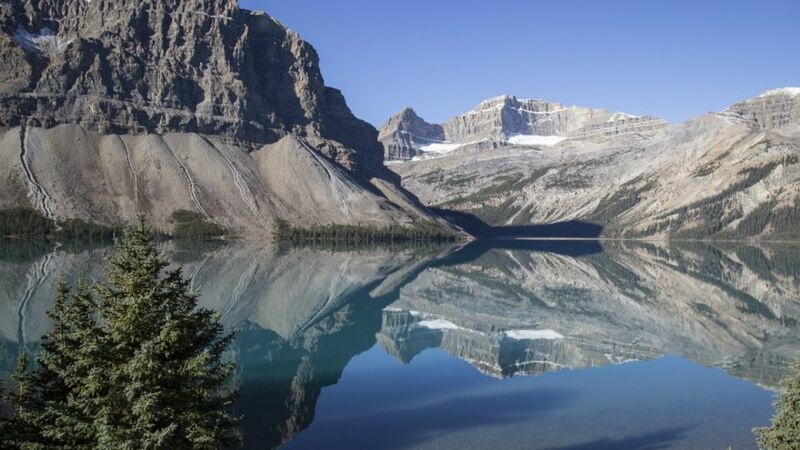 There's stunning glacial scenery plus the snow-capped Rockies along this 230km touring route between Lake Louise and Jasper. “The glacier can eat people,” warns our guide, Dave Owens, from the driver’s seat of the Ice Explorer Terra Bus, the heavy-duty, six-wheeled snow coach that’s transporting us up the ice. His tone is lighthearted but the message is serious, making for a rather unnerving start to our trip on to the Athabasca Glacier. The Athabasca is said to be North America’s most-visited glacier, and the key to its popularity is its accessibility. It’s within walking distance of the scenic Icefields Parkway, which links Lake Louise and Jasper in the Canadian Rockies, and tour company Brewster has nearly two dozen massive Ice Explorers here to ferry visitors on to the ice. As we roar up and down steep inclines, Dave — one of the numerous young Australians working in the Rockies — tells us there are only 23 of these vehicles in the world: 22 here, and one at a research base in Antarctica where it’s nicknamed Ivan the Terra Bus. At a roped-off area, we disembark to take photos and walk on the ice — in my case, slipping and sliding in my sneakers as I gingerly navigate the selfie snappers posing with Canadian flags and cheerfully prostrating themselves on the cold ground in the name of getting the shot. A few fill water bottles with icy slush, although they seem less keen on drinking the contents when Dave later informs us that over-consumption of the minerals contained in the ice can cause stomach upsets. Still, with these smiling faces and sunny autumn skies, danger seems distant. But as we’ve been warned, venturing outside this safe area without expert guidance could put us at risk from unseen crevasses and mill holes, and fatalities have occurred. The glacier, meanwhile, is also facing threats. Having receded by 1.5km since 1890, it’s now said to be losing more than 5m of ice per year. Some scientists have warned that it could disappear within a generation. The small lake at its foot is the youngest in the Rockies and is also predicted to be its most short-lived — Dave tells us it’s expected to dry up within perhaps 50 years as the glacier retreats. A Terra Bus driving back from the glacier. Terra Buses lined up on the glacier. For now, though, the glacier marks the halfway point along the Icefields Parkway, the 230km touring route known more prosaically as Highway 90. Passing through Banff and Jasper national parks, the road is named for the Columbia Icefield, the largest in the Rockies, which feeds eight major glaciers including the Athabasca. We spot dozens of glaciers large and smaller from our coach during our day touring the parkway’s full length — if we’re eagle-eyed, potentially as many as 132, according to our exacting driver-guide Matthew Rodgers. The drive itself only takes three hours non-stop but the landscapes are such that you can easily take more than double that time, stopping regularly to admire the views. Among the highlights — all busy with more selfie snappers, some risking life and limb by climbing the safety barriers to get a better picture — are the waters thundering through Athabasca Falls and the brilliant, glassy blue of Bow and Peyto lakes. You’ll have seen the latter two in photographs, their distinctive colouring derived from the minerals in the very fine “rock flour” washed off the surrounding mountains and suspended in their waters. They’re as quintessentially Rockies as the snow-capped mountains and the bull elk with their velvety antlers, but seeing them in person is still somehow as surprising and startling as spotting a herd of big-horn sheep or deer by the roadside. The Athabasca River, near Athabasca Falls. Archetypal in its own way is the welcome sight that awaits me at our lunch stop at The Crossing cafeteria. My Dog the Mountie Hunter hot dog — the name a distinctively Canadian play on the American reality TV show starring bounty hunter Duane “Dog” Chapman — is piled high with beef chilli, ketchup, mustard, onions and relish. It’s so enormous that it’s messy and hard to eat, but a salad wouldn’t seem quite so fitting amid all this wilderness. We end the day looking out for elk as we pull into Jasper. Autumn is mating season, when bull elk can become highly aggressive defending their harems (as they’re known) of females and we see a few in the distance by the Athabasca River. I just hope none of the selfie snappers get too close: elk might not eat people, but those antlers are no joke. Gemma Nisbet was a guest of Rocky Mountaineer.